Yes, one more result was to be announced and that’s the winner of the Indibloggies T-Shirt Slogan competition. Thanks to all the participants for the interest shown. We received lot many entries, and Sakshi and me were unanimous in selecting the winning entry submitted by Nazim Ur Rahman, “I am a Blogger. Need I say more?” Congratulations Nazim! You won yourself a T-Shirt that you designed :) Thanks a lot Sakshi for sponsoring the T-shirts and for suggesting this competition. Congratulations again to the winners at Indibloggies 2005 edition who would be sent the T-Shirt once they let me know their Tee size (the T-shirt shown here varies from the actual gift, which would be a Beige round neck Tee). Hey, you can get this Tee too. Yes, if you wish to get this beautiful Indibloggies T-Shirt and proclaim proudly to the world that you blog, you can buy it from us. This superior quality Black Panther Indibloggies Tee is being made available to you, thanks to Sakshi, at a special price as follows. To order your T-Shirt send us an email at indibloggies at gmail dot com with a subject “Tee Order” mentioning the size, type, quantity and your complete postal address. Once we get your details we would let you know the total price (inclusive of courier charges for your area, or To-pay charges if applicable) and you may pay either through online money-transfer or a Demand Draft. In the seventh article of the series "Hum Blogistani!" Peter Griffin talks about the life-changing experience with SEA-EAT and predicts that blogs will not replace big media but complement it instead. Mumbai based Media Consultant Peter is a freelance writer and prolific blogger (there is more to him than we can accommodate here). He blogs at Zigzackly. The online edition of his TOI column Mousetrap can be read here. hy, you wonder, is this chap writing a piece in this series? He isn't a pioneer blogger, or an A-lister, he doesn't have legions of adoring fans (or even the type that love to hate him). He doesn't even make it for Best Tagline. Fercryinoutloud, the loser doesn't even have comments disabled. Ladies and Gentlemen, the wait is over. The hectic final voting spell spread over a week that also saw a repoll for the Best Designed Indiblog category -- an unprecedented event in the history of the Indibloggies -- is finally over and we are all set to declare the results. The public poll, thanks to the sophisticated poll script that we used this year, demanded that you unearthed all those email IDs that you created but never used, including those "2 minute" mailinator ones. And those who only had that lone yahoo ID since years were also delighted to get the additional Yahoo ID. It was, all in all, a peaceful poll with no untoward incidents. A record 1278 people registered for the poll but only 892 actually cast their vote, by virtue of those "a@b.com" email ID that were used to register and those cookies resting on your machine, I am happy that they could verify that the system was quite hard-wearing, the polls couldn't be sturdier than this, IMHO. A copy of The Big Moo : Stop Trying to Be Perfect and Start Being Remarkable by Seth Godin and 32 other renowned authors. A copy of the book "At Home in the World : Collected Writings from The Wall Street Journal" by Daniel Pearl and gifted by Dilip D’Souza. One Indibloggies T-Shirt sponsored by Sakshi Juneja. The first runner up blog in this category Digital Inspiration wins a copy of Visual Studio 2005 Standard Edition worth $299 sponsored by Microsoft India. This and the second runner up blog Michael Parekh on IT also win one Exam Simulator each, of their choice, sponsored by Whizlabs. DesiPundit is the winner here. The hot one-stop news channel of Indi blogdom is a clear favorite among readers and bagged 46% of the votes cast for the category. The blog representative wins one Indibloggies T-shirt sponsored by Sakshi Juneja. The public opinion seemed quite divided on this category, with all the blogs in the fray finishing very close. This was one category that cheesed off a lot of people and this is probably the last time it appears at the Indibloggies. An award Rs.500/- from Ganesh of Rupya.com. 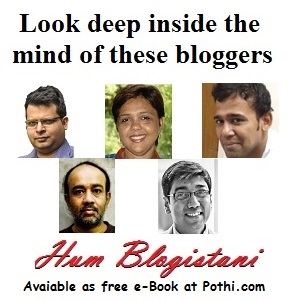 Sight Screen a group blog with authors such as Arjun Swarup and Prem Panicker. The blog representative wins a 25MB hosting package worth Rs.1000/- from Web1 Solutions and one Indibloggies T-shirt sponsored by Sakshi Juneja. DesiPundit is the winner here with a massive 45% votes in its kitty. The blog representative wins a copy of The Big Moo: Stop Trying to Be Perfect and Start Being Remarkable by Seth Godin and 32 other renowned authors. Copies of three books, Shakuntala: Smriti Jaal by Namita Gokhale, Jannat aur Anya Kahaniyan by Khushwant Singh and Hamara Hissa, a collection of stories edited by Arun Prakash presented by Shail. One year registration for a new .IN domain (worth Rs.750) from Amit Gupta. Navneet Bakshi's book "Mein bhi bana Minister"
Sushma Jagmohan's Hindi novel "Zindagi Email". The winner blog is Marathi Sahitya and wins one copy each of P.L.Desphpande’s Marathi books Poorvarang and Apoorvaaii from Marathi Blog Vishwa. The runner up blog is Disamaji Kahitari… wins P.L.Deshpande Marathi book Jaave Tyanchyaa Deshaa presented by Marathi Blog Vishwa. Hearty congratulations to all the Winners! Thanks also to all the sponsors for being associated with and adding glory to Indiblogging. My heartfelt thanks to all the Jurors for your time and efforts. I also convey thanks to Jitendra Chaudhary to bear the postage costs for the gifts being sent by the Indibloggies. The money donated by Dr.Vivek Kochikar would be kept in buffer and utilized in paying the hosting costs next year on. Winner may collect their award-badges here. All prizes would be sent to Indian destinations only. All winners are requested to send an email at indibloggies at gmail dot com with subject "PRIZE CLAIM 2005" with their complete postal address. Please allow 4-6 weeks for the gifts to reach you, no intermediate correspondence on this delivery status of the awards please. Some other pending awards would be added to this post later. We do not take responsibility for loss of gifts in transit. Gifts cannot be exchanged for cash. We reserve the right to alter or cancel any or all of the awards mentioned above. No objections would be entertained. In the sixth article of the ongoing series "Hum Blogistani" Ravishankar Shrivastava talks about the scenario in blogging in Indian languages. xpressions. You find it everywhere. At a cool corner of a collage café, at the Bus adda, in a train compartment, at a Party, at your work place and, may be, even during those intimate moments with your beloved. Everybody out there is trying to forcefully convey his or her feelings. At times, you have to shout, make faces and even shove elbows to make yourself heard. Try fathoming a conversation within a group and you will quickly realize that nobody actually seems to be listening, yet every one of them is in a great hurry to express opinion. You also want to express yourself eloquently. However, you don’t get yet get an audience. You shout. Damn it, nobody cares. What do you do now? Blog, an alternative medium to express one’s expression, can change things upside down for you. Even if you whisper in your blog, you will be noticed. In your blog, you can express yourself without any interruption, without an argument, and without an express permission from anybody else! To add to the beauty, you and your audience can share views in real-time through the blog-comments. With more than 300 nominations made over 10 days and close to 25 Jurors browsing through the myriad flavors of writing and rating them, Stage one of the Indibloggies 2005 edition has come to an end. I do not have enough words of appreciation for the members of the Jury; many of them went out of the way to help me during the process. For the first time in the Indibloggies, and perhaps in the history of the internet, a social bookmarking tool was used in an award event. Indibloggies used the bookmarking tool del.icio.us for the nomination and Scuttle for the juror-rating phase . We had customized bookmarklets and tag-generators for delicious. The Scuttle interface was also customized for the occasion (compare the actual interface with the customized one). Here is a screen-grab of page showing the final tally. This was the first time I power-used Scuttle, some of my code such as the "Users list" and suggestions might actually make it to the next version of the tool. An interesting side effect of my using "Scuttle" was the Hindi localisation of Scuttle, that happened thanks to my Hindi blogger friends. The Hindi gettext file is available here. Jurors rated blogs in several award-categories on a scale of -1 to 5. A weighted score was calculated based on all Juror ratings for a blog in a particular category and a merit list prepared. The final list, in almost all categories, that makes it to second and the final stage comprises of blogs that were 40 percentile or above in the merit list. Juror Srijith prepared a flash video, a "how-to" guide for the Jurors while Saket and Pawan compiled exhaustive step-by-step guides for the nomination process. Many people complained about the nomination process being too geeky (though the 5-step guide, that came up of Arnab’s suggestion, evoked a good response) and I had to put a conventional email-form but that resulted more-or-less in what we all know email forms result in, spamming and multiple nominations. One of the blogs almost suffocated my Inbox, so much so that I had to ask the blog-owner to stop his people from flooding my mail-box. 63% of the nominated blogs were Blogger.com blogs. If few other blog-hosting services like live-journal may be ignored, Wordpress blogs must have been a close second. In all 193 blogs were rated by the jurors with about 15 blogs ending up with a negative or zero final score. Like last year, a private mailing list had all the Jurors deliberating and discussing over issues before and during the rating process. The whole rating process was also audited throughout, by three of the jurors to ensure a smooth completion. Juror Saket nominated the highest number of blogs, a whopping 115 blogs. And now, without any further ado, we present the list of Stage-1 winner blogs that have qualified to participate in the final voting. To me this is the notable outcome of this event, if this list contains even one blog that you have never read before, my mission is accomplished. For your ease, we have a category wise OPML list available for you to subscribe (most of the newsreaders provide for importing an OPML list). Listing in each category is alphabetical.